Documentarian Eleanor Coppola makes her fiction debut at the age of 81 with this charming is slight tale of a woman on an unplanned jaunt through the French countryside. The film's plot is paper thin but the combo of the beautiful scenery and Diane Lane's incredible screen presence makes the film both watchable and enjoyable, even if you roll your eyes a bit. The story is cliched. 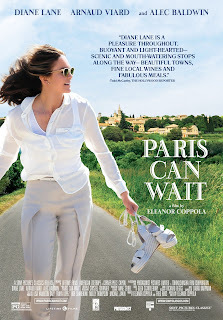 Married woman set to join her husband in Paris ends up taking a ride with his french friend who shows her the quieter, patient, side of life, and she is swept off her feet. The exploration of American/European difference here is neither profound nor fresh and revels in trite platitudes. Similarly with the who carpe diem, stop and smell the roses sort of message. But that is the charm of Paris Can Wait. It's not trying to be anything more than a lovely fantasy. I did like how Coppola doesn't attempt to justify Lane's emotional journey with any sort of resentment towards her spouse or lack of meaning in her life. She is advancing through her life and exposed to new flavors, new tastes. The film just lets her experience that and I appreciated it. She is too polite to challenge her french abductor's lack of concern for her explicit wishes and the film glosses over that. But the film tries to say that she would have stopped anything she wasn't on board with. I'm not sure it does a good enough job of convincing us. The film is fluffy and a bit irresponsible, but I did appreciate the spirit of tasting life and what it offers. Also, I'm not sure another actress could have pulled it off quite so charmingly.